The V-LCD70MD-3G includes the base unit with a preinstalled MD-3GSDI-A module providing an additional 3G/HD/SD-SDI input with loop through. 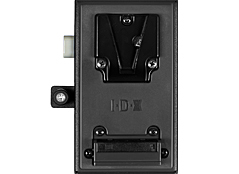 The V-LCD70MD-O version includes the base unit with a preinstalled MDO-3GSDI-A module providing a 3G-SDI output converted from the HDMI input. Finally the V-LCD70MD base unit comes with no preinstalled module. 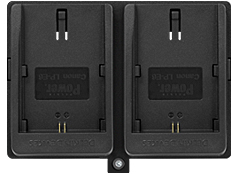 * V-LCD70MD-3G shown. Battery adapter is sold separately. MD-3GE 3G-SDI Input Module with Loop-Through. MDO-3G** Dual HDSDI Output Module converted from HDMI input. HDCP compliant. 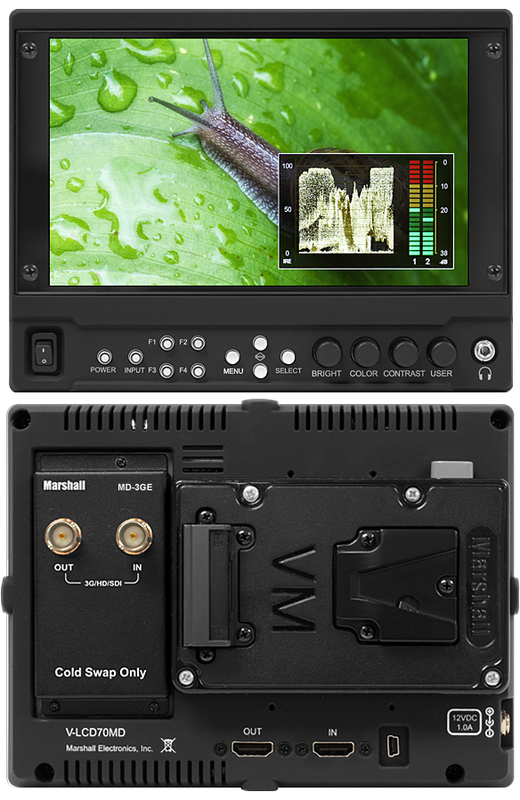 The Next Generation of camera top monitors have arrived with the advent of the new Marshall Electronics Modular design Camera Top Series including the V-LCD56MD 5.6", V-LCD70MD 7" and V-LCD90MD 9" monitors. Each of these models comes in a choice of three configurations. Building on the features that made the V-LCD70 series famous these models add even more user friendly features. 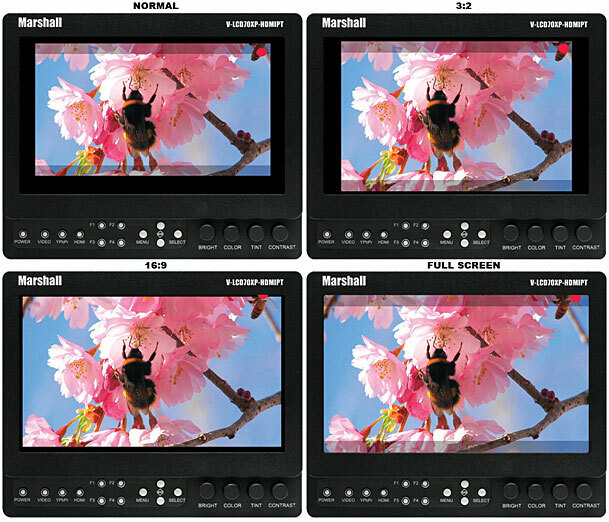 New Icon driven Menu System, Waveform Display with dual Audio Bars, Front Panel Headphone output, Variable Pixel-to-Pixel function plus Marshall's industry leading PEAKING Filter now in four colors for easier focus assist make these monitors a must have appliance for serious photographers and videographers producers and directors alike. This 7" monitor offers a high brightness 800-nit, high resolution 1024 x 600 LED Backlit IPS panel and standard features including a wide variety of formats and markers, 4 user-configurable front panel function buttons, RGB Check Field / Field Detect, RGB gain and bias control, polycarbonate screen protection. New features include multiple DSLR presets, six User Presets, Adjustable IRE Clip Guide, and Backlight control just to name a few. 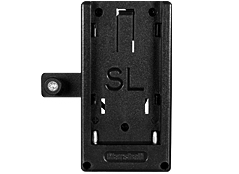 Marshall's new DSLR RATIO ADJUSTMENT feature allows users to scale video that does not completely fill the monitor's screen when connected via HDMI in "Record" mode on certain Canon DSLRs. This new feature allows the user to scale their DSLR video output, fill the screen, and eliminate black pillar bars with a variety of options to choose from. The user has the option of choosing between NORMAL, 3:2, 16:9, and FULL SCREEN. The DSLR RATIO ADJUSTMENT feature can be programmed to one of the front panel's four-button presets for quick and easy access. 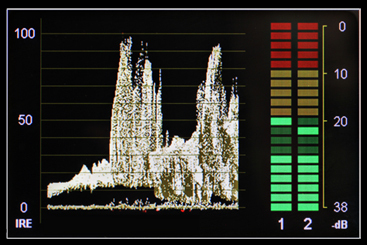 The new V-LCD70MD incorporates both a Waveform display and Stereo Audio bars. 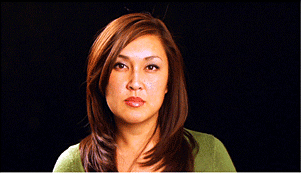 These may be displayed separately or together in any one of the four corners of the monitor. 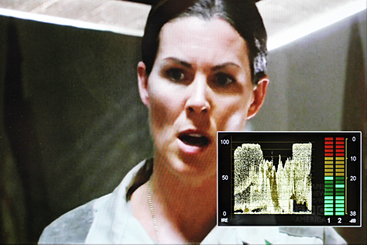 The Stereo Audio is de-embedded from either the HDMI input (8 channels) or from the optional 3GSDI input (16 channels). Any pair of the available channels may be selected for both the display and the Headphone Output. The Zebra function (Clip Guide) is used to visually filter data on the screen that is under a Lower Threshold or over an Upper Threshold. 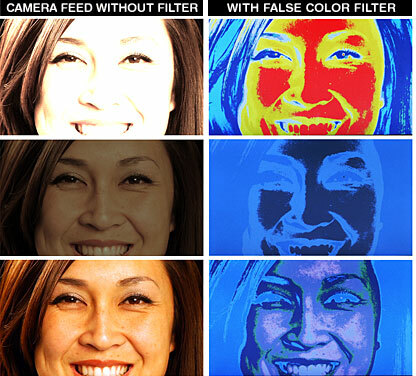 Data on either side of the filters can be displayed with a custom color. 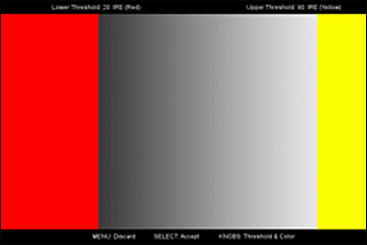 In the image above on the Right, the Lower Threshold has been set to 20 IRE (Red). This means that any part of the image UNDER 20 IRE will be "colored" in RED. Also, the Upper Threshold has been set to 90 IRE (Yellow). 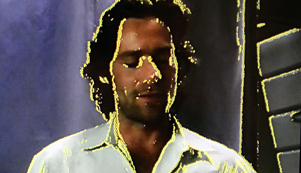 This means that any part of the image OVER 90 IRE will be "colored" in YELLOW. The Zebra function can also be inverted to filter the area between the Upper and Lower Threshold. The color selected for the Lower Threshold acts as the color for all inverted Zebra data. In the image on the Left, the Lower Threshold is set to 20 IRE and the Upper Threshold is set to 90 IRE. 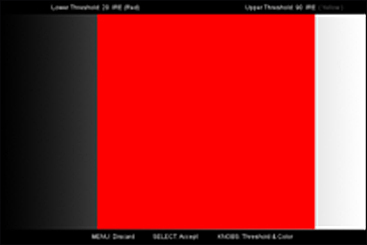 The Zebra Invert will filter all data in between 20 IRE and 90 IRE and display it in RED. The outer square represents the entire image and the inner grey box represents your current Pixel-to-Pixel selection. Use the COLOR knob to move your selection LEFT and RIGHT. 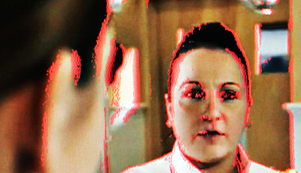 Use the CONTRASEnable the Input Crop function to select the area of active video that you would like shown on the image display. Select the desired Input by accessing the Adjust option below the main function:T knob to move your selection UP or DOWN. Press the SELECT button or the ROTOMENU knob to lock in your selection. When you are satisfied with the position, press the SELECT button or press the BRIGHT knob to confirm your selection. The new cropped selection will be displayed on the screen. If your Aspect Ratio is set to AUTO, the monitor will select the closest aspect ratio to the dimensions of your customized Input. Four user-definable function buttons can be used for direct access to various settings. Functions are assigned using the on-screen menu or by highlighting a function and pressing one of the function buttons. See User Settings Submenu for information on changing Functions.